A few moments of study revealed that the seven circled formations are half of famous Waynes: JAN Wayne (new to me, German DJ with a spare Wikipedia presence), Wayne ROGERS (who played Trapper John on “M*A*S*H”), BRUCE Wayne (a.k.a. Batman), Wayne ANTHONY (Revolutionary War general, had to look him up), many-time Grammy winning jazzman Wayne SHORTER, Vegas lounge lizard Wayne NEWTON, and rapper LIL Wayne. So even though I only knew 4.5 of the 7 (not sure I’ve heard of Shorter), you only need to know a few of them to see what’s going on. Pete’s certainly been taking it easy on us, but I suspect we’re about to get the hammer in April or May. Just a little too quiet these first three months, like when nothing happens in the first 15 minutes of a horror movie. Will April be the cruellest month? See you back here in a few weeks to find out. I really hope you’ve said this jokingly. Great puzzle, just very difficult to backsolve a one-hit wonder who wikipedia has omitted from “category: Musical groups established in 1996.” For me, only two of the seven Waynes ring a bell, and I visualized the pattern as ripples on a surface (the result of a splash). As a shot in the dark, I would have submitted Reel Big Fish, or – without the 90s hint – ELO. pretty sure this wasn’t said jokingly… with 159 correct answers it’s at the higher end of Muller’s usual total correct. 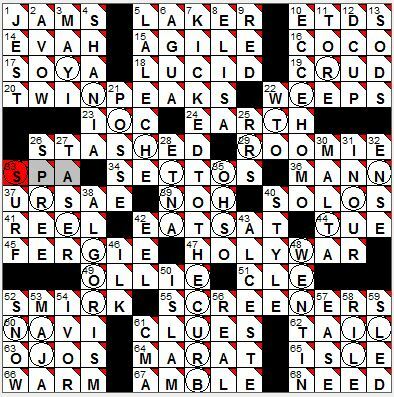 I’m not complaining, but I will say that the .puz version of this puzzle that I did in StandAlone’s Crosswords app on the iPad had no circled squares, which pretty much made finding the meta impossible…for me at least. Maybe in the future, include some sort of heads up that there are features that won’t be visible. Or maybe I just got a bug loading the puzzle. Anyway, looks like it was a gettable meta with the circles. Update: I tried to include a screen shot, but that wasn’t happening. But I did just load it again and no circles. A few people using Android and iPad apps mentioned that the circles didn’t come through. They are in the puzzle file, and Across Lite reads them fine, but some apps don’t. One solver said that upgrading his Android software fixed the problem. In the future, I will endeavor to mention that the grid contains circles to alert solvers. I can’t imagine solving this puzzle without them! I also solved it on an iPhone using StandAlone’s app, and wasn’t able to see the circles either. I ended up guessing the Breeders as the 90’s band. I came to this tenuous conclusion based on TWIN PEAKS (the Deal sisters are identical twins), the title “Making a Splash” (Last Splash was their breakthrough album), and “Happiness is a Warm Gun” (they covered it on their first album, Pod). I figured it wasn’t correct, but I was just hoping there was something larger going on that I had missed, and these hints were just additional nudges in the same direction. I’ve learned that Stand Alone software has a new app for ios 7 that does display the circles – their old “Crosswords Classic” app does not display them unfortunately. I don’t know how long I can hang in with these… stuff from later than the mid-80s I only know dribs and drabs about. However I did know most of the Waynes, so at least I had something to work with even though I didn’t know that the “Stacy’s Mom” band was called Fountains of Wayne. Actually I only know the song from the car commercials anyway. The Revolutionary War general was Anthony Wayne, not Wayne Anthony. There used to be an old restaurant, the General Wayne Inn, in Merion, outside of Philadelphia. The place became notorious when one of the owners of the place was murdered there by one of his business partners. The only one I was not familiar with was Jan Wayne. It was Wayne Fontana and the Mindbenders. 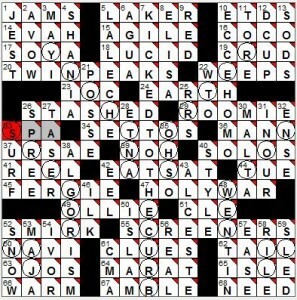 I learned this from Pete after I guessed it wrong (I went with plain old Wayne). Wayne Fontana and the mind benders is an awesome alt-entry, since Wayne, Fontana (Italian for fountain I’d wager) and mind benders all make sense. Not that I personally encountered a problem with the circles, but can people who did get something like a half-credit? Just a thought.